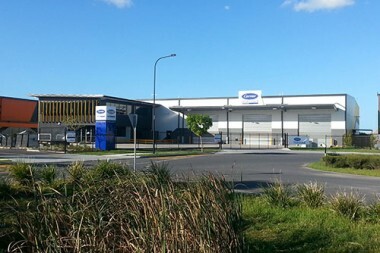 TradeCoast Central has recently completed this purpose built office and warehouse facility of1,744 square metres at 44 B Amy Johnson Place, TradeCoast Central. The build was 19 weeks with a client fitout period of 8 weeks including tradewaste system and wash down facilities. CarrierTransicold has now moved into their brand new office and will be operating from the site. Carrier is a world leader in high technology heating, air-conditioning and refrigeration solutions. Carrier experts provide sustainable solutions, integrating energy efficient products, building controls, and energy services for residential, commercial, retail, transport and food service customers and their founder, Dr Willis Carrier, is credited with inventing modern airconditioning in 1902. Carrier Transicold is the number one provider of transport refrigeration solutions and services inAustralia. Within the local and intrastate sector the Carrier brand dominates supplying equipment to operators such as Woolworths, Coles, Linfox, Toll etc. The intermodal-rail sector is dominated by Carrier in fleets such as Rand Logistics, QR National, SCT & Pacific National. Carrier Transicold Australia operates branches in Derrimut, Melbourne,Homebush, Sydney, along with close partnered, authorised dealers operating in Adelaide andPerth. An extensive network of close to 100 service centres are located nationwide close to major transport hubs, main roads and rail hubs to provide nationwide support. Carrier Transicold has been an industry leader, providing customers around the world with the most advanced, energy efficient and environmentally sound container refrigeration systems and generator sets, direct-drive and diesel truck units and trailer refrigeration systems. CarrierTransicold is a part of UTC Climate, Controls & Security, a unit of United TechnologiesCorporation. United Technologies Corporation is a diversified company whose products include Carrierheating and air conditioning, Hamilton Sundstrand aerospace systems and industrial products,Otis elevators and escalators, Pratt & Whitney aircraft engines, Sikorsky helicopters, UTC Fire & Security systems and UTC Power fuel cells. UTC operates more than 4,000 locations in approximately 71 countries with revenues in excess of US$58 billion.